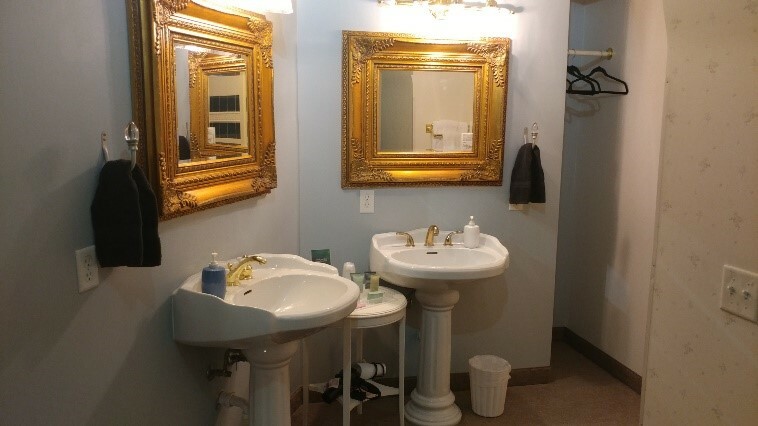 Lodging in Cedar City has never been more luxurious and quaint. The Iron Gate Inn offers seven unique and spacious suites with sitting areas and views of our lush property. 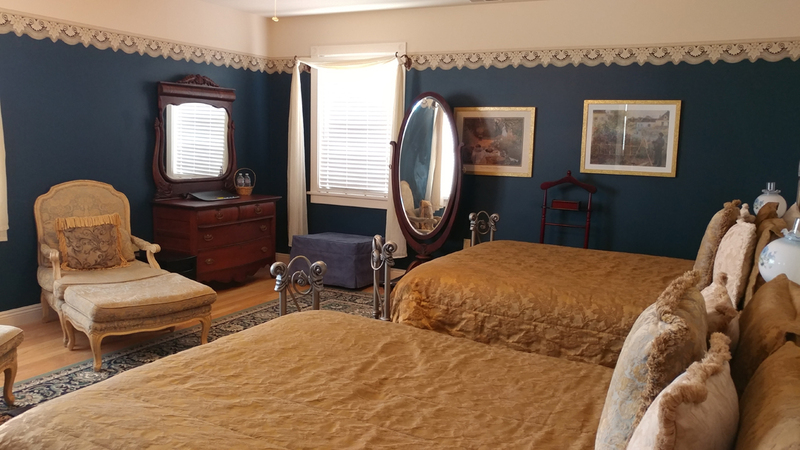 These Victorian Cedar City lodgings are a hidden gem, as this bed and breakfast offers period furnishings with modern amenities. 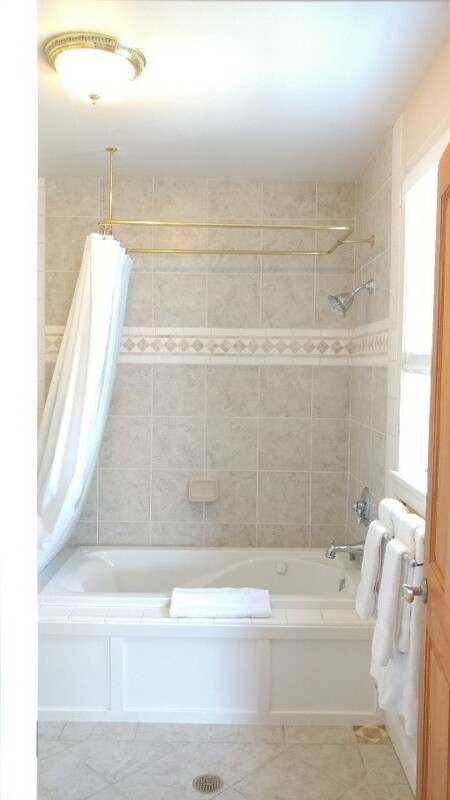 All of our rooms offer private baths and luxurious linens to send you off for a night of wonderful dreams. Drift back to a time of gentle conversation and afternoon refreshments at the Inn, built in 1897 and one of the ‘grand ladies’ of her time. The Iron Gate Inn still has the original fireplace, doors, floors, and windows of the Victorian home. Walk the grounds lined with honeysuckle overlooking the patio and mature fruit trees with apples, plum, and peaches. 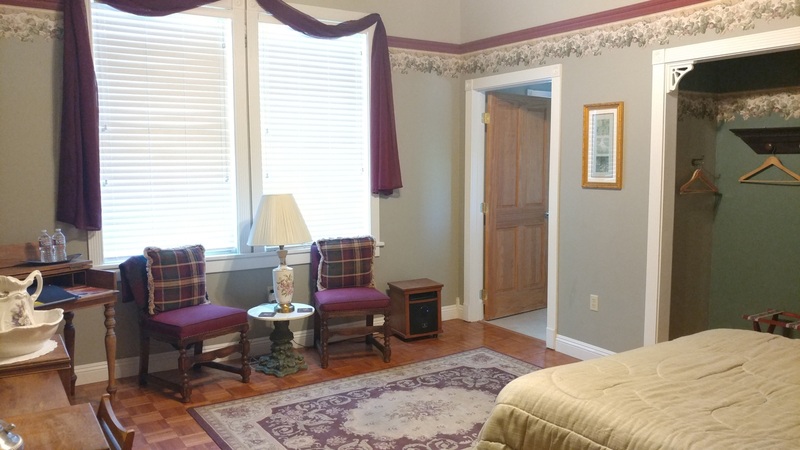 Our Cedar City accommodations have stayed true to their rich history, while still offering the comforts of home with daily room service and central air conditioning. 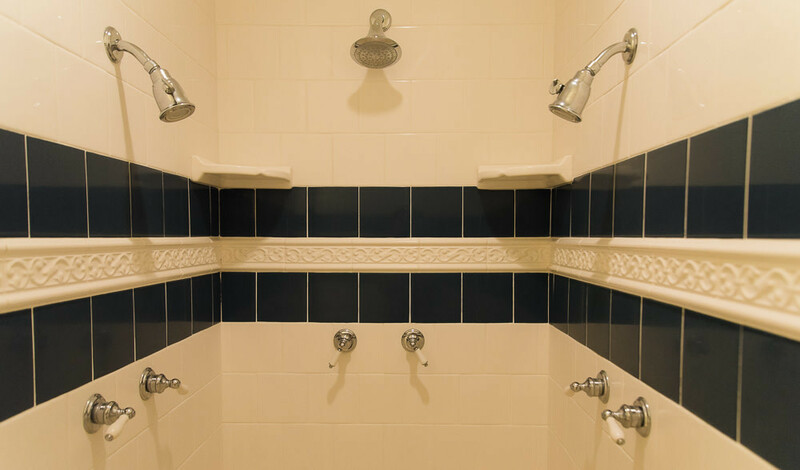 Enjoy complimentary William Roam bathroom amenities, including eco-friendly soaps, body wash, lotion, shampoo, and conditioner. 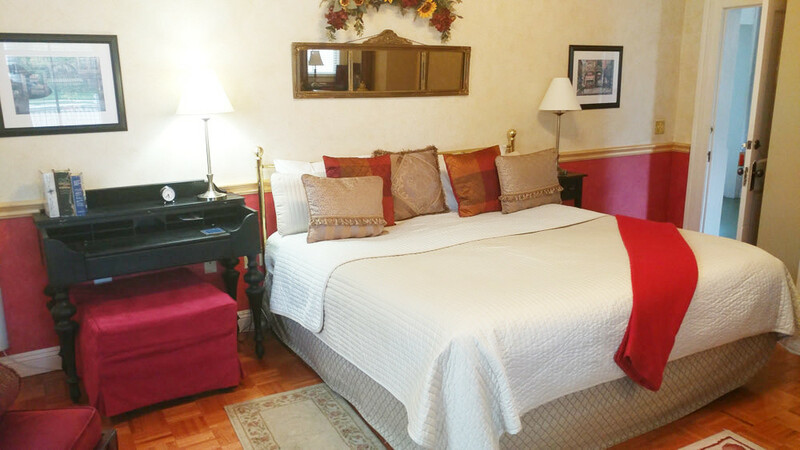 Sleep well on King and Queen-sized pillow top mattresses and start every morning with a fresh gourmet breakfast before you start your day in Cedar City. 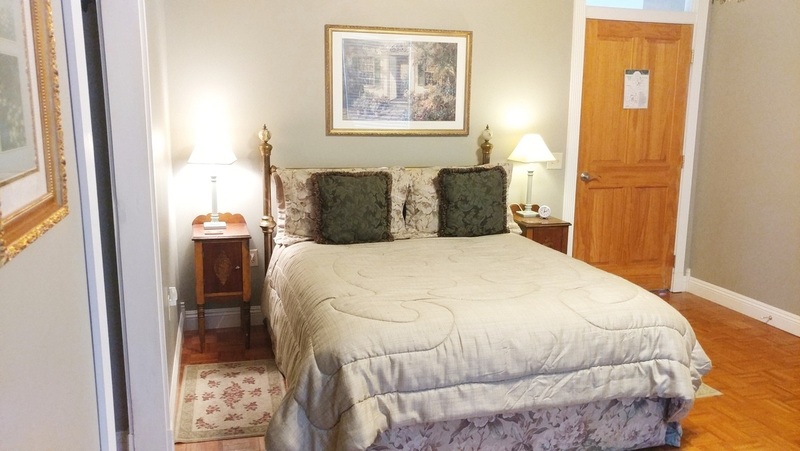 Learn more about our room occupancy in our inn policies. 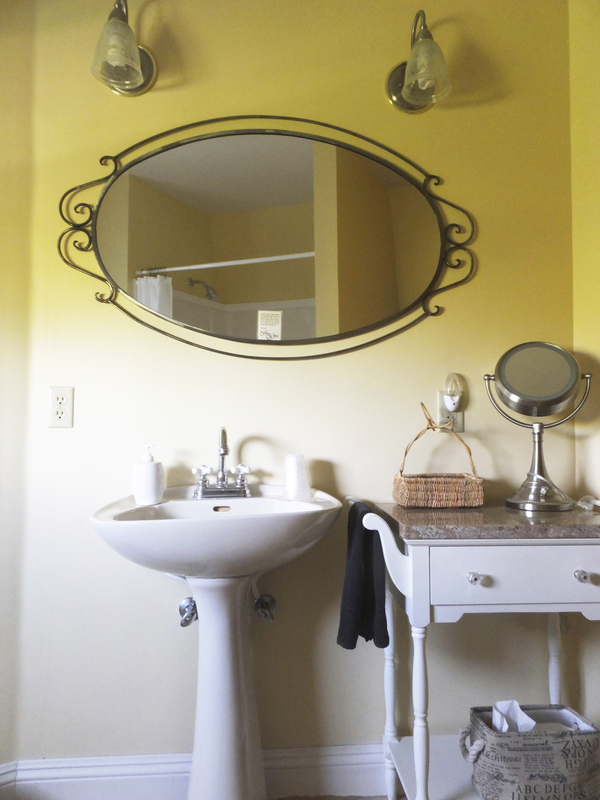 Our lodgings in Cedar City are your retreat back in time, full of leisurely strolls and simple pleasures. Considered our Honeymoon Suite, the blue and violet color hues add the perfect romantic setting for our newlyweds. 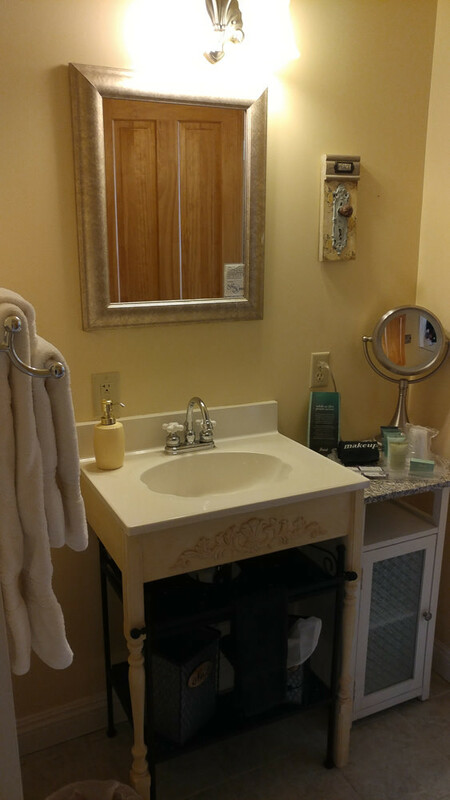 Delight yourself in Joy Darlene's bathroom featuring double vanities, 2 luxurious sinks, and a spacious walk-in shower with a triple-headed showerhead. 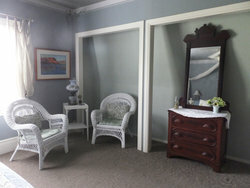 The décor features white wicker furniture, décor in tranquil blues and greens, and is also the only carpeted room offered at Iron Gate Inn. Allow yourself to become enveloped in the wonderful garden ambiance of this Joy Darlene King Room. This elegant room offers a private door to the veranda along with an elegant private sitting area situated right in front of our stunning front garden, the absolute perfect place to linger with a morning newspaper or afternoon tea. The Lucy Belle King Room features a spacious bathroom with a shower and décor in luxurious crimson and gold. Take a view of the grounds and namesake wrought iron fence from this charming second floor room. 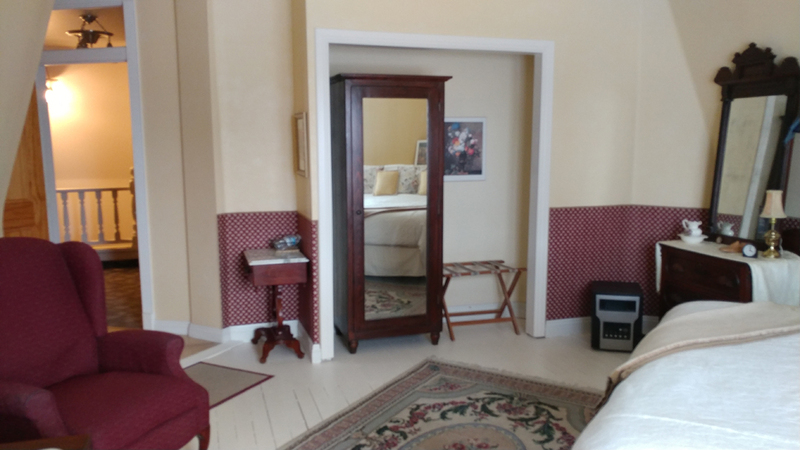 The Mattie Maple King Room has rich garnet fabric covering the walls, original pine floors with cream paint, and complementing mansard architecture of the home’s exterior. 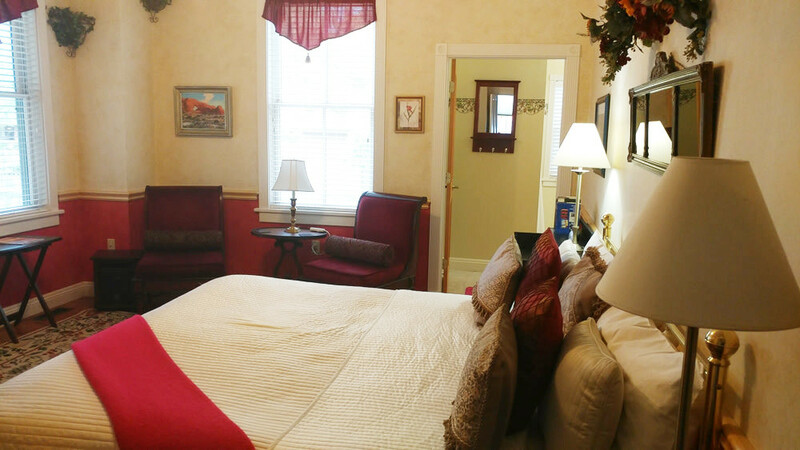 Unwind in your large in-suite Jacuzzi or recline on the 2 chaise lounge chairs in our Carolyn June Double Queen Room. 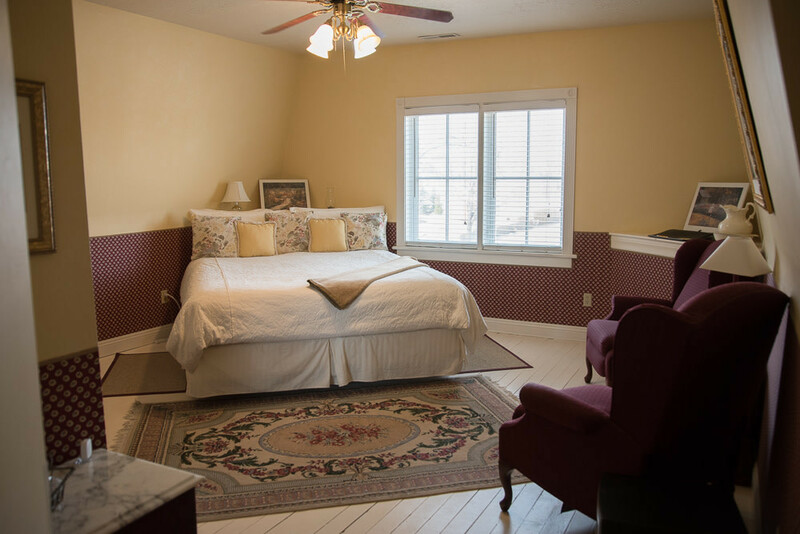 This second floor room offers a view of our apple trees to the north and the eastern window showcases the Dixie Mountains. 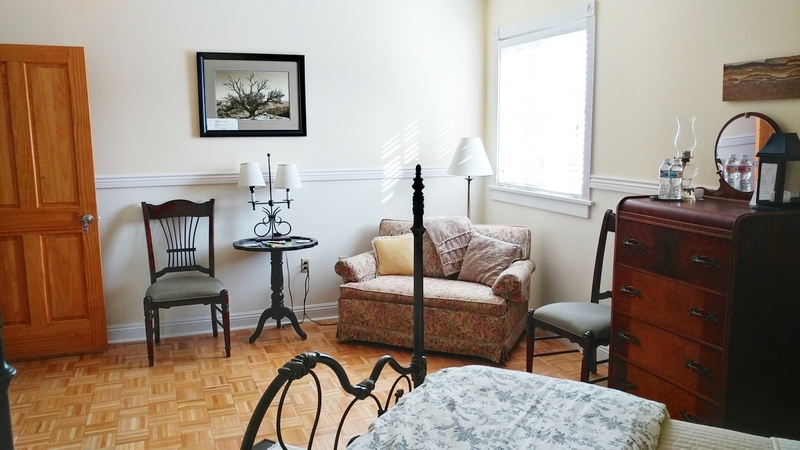 The Carolyn June Room can be paired with the Emma Jane Room to create a two-room suite. 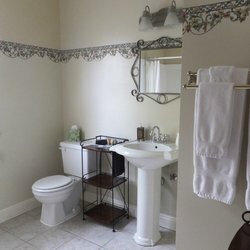 Perfect for a small family. 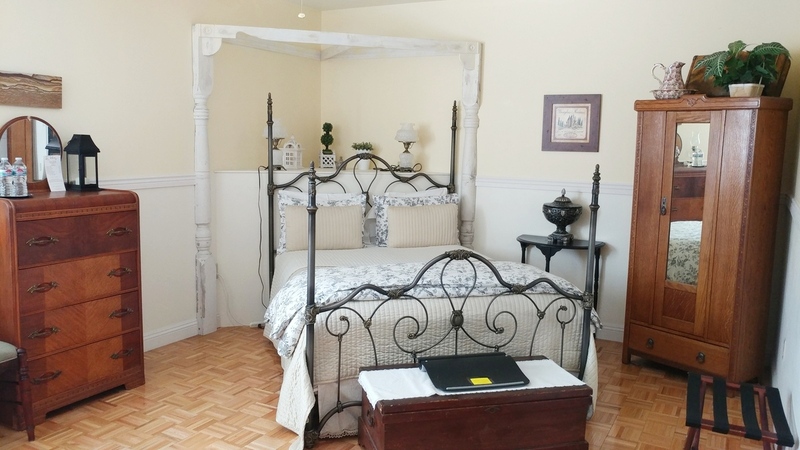 The home’s original porch posts form a trellis over the bed of this warm romantic room. 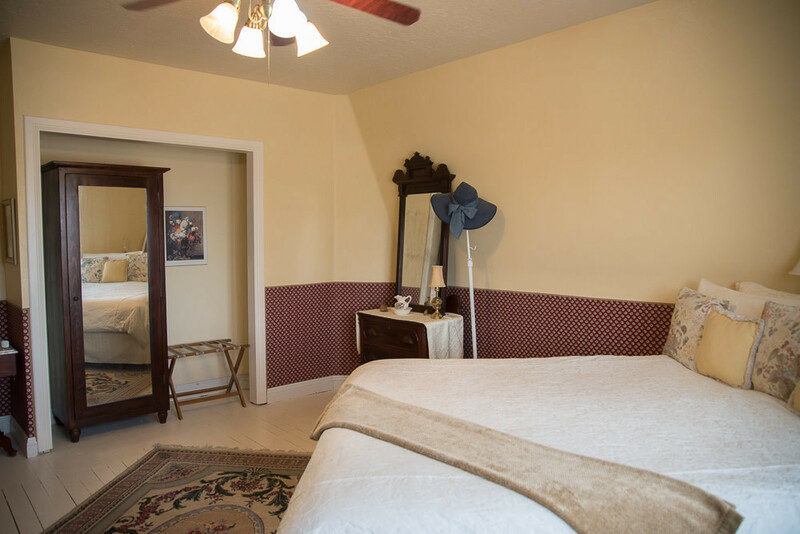 The Emma Jane Queen Room envelopes you with buttery yellow walls and classic black and white touches within this warm room. The Carolyn June Room can be paired with the Emma Jane Room to create a two-room suite. A twin hide-a-way for a third guest is also available. 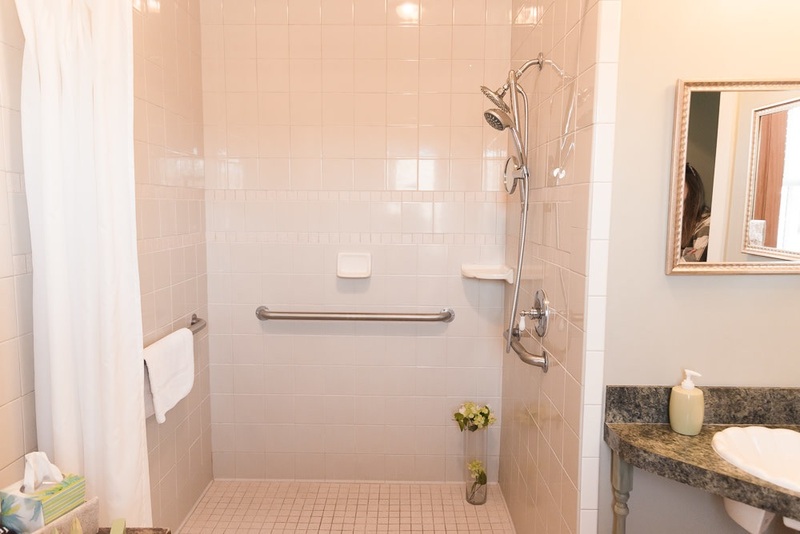 This main floor room offers wheelchair accessibility for guests in need of additional comfort. 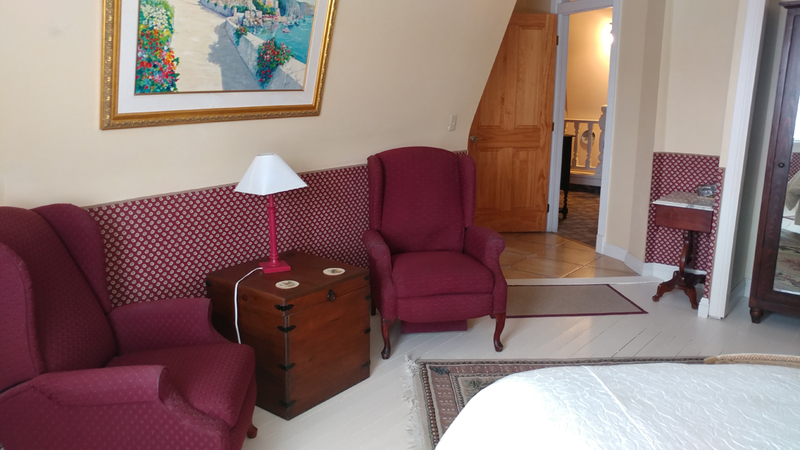 The Grace Mary Queen Room is tastefully decorated with deep greens and burgundies, with large windows overlooking the apple trees on the north lawn. The shower is also accessible and very spacious. 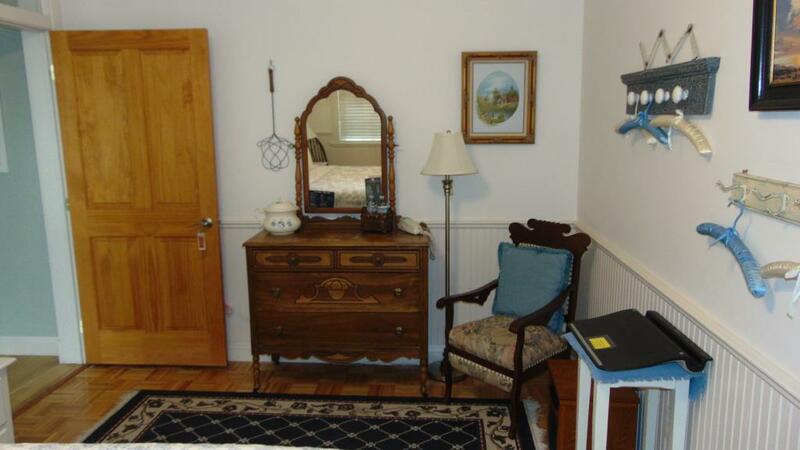 Discover this quaint country room that offers a view of the garden patio with plum and peach trees. 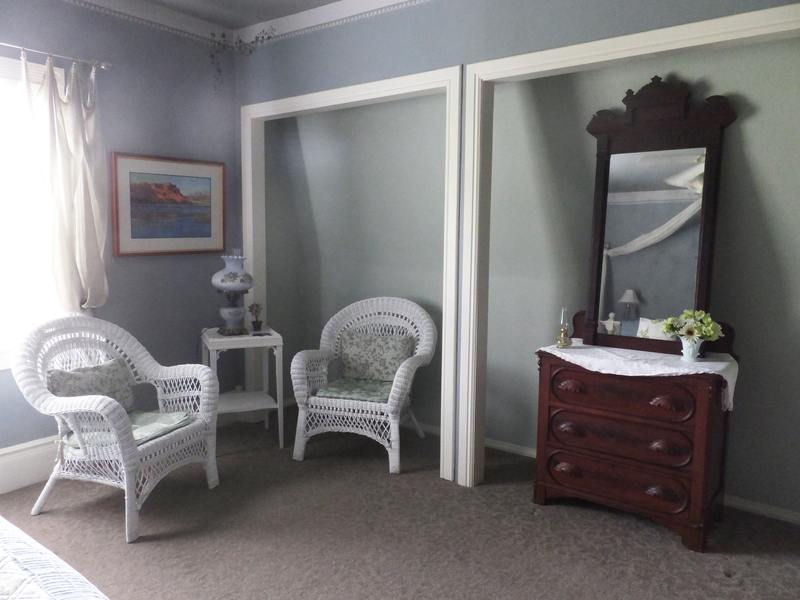 The Ruby G Queen Room is decorated with crisp whites and blues as well as beadboard throughout the room. 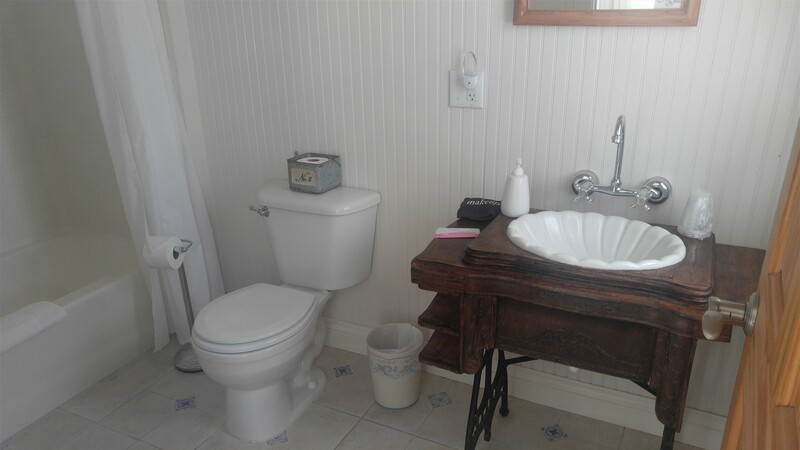 The Ruby G Room features a bathroom with a full tub and shower, as well as an antique sewing machine as an added delight.